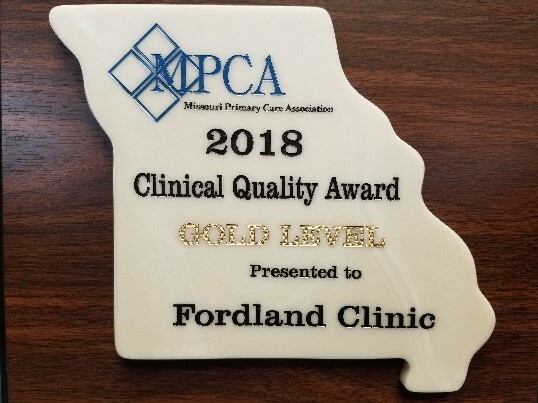 Fordland Clinic, Inc. is very proud to announce that we are the recipient of the Missouri Primary Care Association’s “Gold Level” for Clinical Quality Excellence! The award was presented by the Missouri Primary Care Association at the Annual Conference in Branson, MO on October 26th, 2018. Each year, the Missouri Primary Care Association acknowledges Community Health Centers who meet or exceed a set of nine clinical quality measures. These quality measures focus on such areas as diabetes control, blood pressure control, smoking cessation, cancer screenings, and weight management. The Clinical Quality Excellence awards are awarded as follows: Bronze awards are presented for meeting or exceeding 5 out of 9 criteria, Silver awards are presented for meeting or exceeding 6 out of 9 criteria, and Gold awards are presented for meeting or exceeding 7 or more of the 9 criteria. Fordland Clinic, Inc. met or exceeded goals on 7 of the 9 criteria and were within 0.2% of meeting the goal on an 8th measure. We are extremely proud of the time, commitment, and effort of our staff in meeting or exceeding these goals and earning this honor!